On August 25, 2017, the sky was dark and churning as a team of Natural Sciences professors, staff members and students began releasing the first in a series of 13 weather balloons that produced the only source of sounding data available from Central and Southeast Texas during Hurricane Harvey. The data, collected in partnership with the University of Houston, was used by the National Weather Service to create weather forecasts during the hurricane covering 33 counties in South Central Texas, including Austin and San Antonio, and to brief state and local officials. Soundings, or readings from a high-altitude weather balloon, collect meteorological information like pressure, temperature, dew point temperature, wind speed and wind direction — all critical data points when forecasting the movement and behavior of a storm system. A large geographical gap in operational sounding sites exists over Austin, San Antonio and Houston. The lack of real-time data during weather events “lead[s] to great uncertainty in weather model forecasts and, as a result, planned emergency management team responses,” says Gary Morris, dean of the School of Natural Sciences at St. Edward’s University. Three Natural Sciences students participated in the launches led by Morris that supplied critical information as Harvey made landfall on the Texas coast and then meandered over Houston. As a result of their work, millions of Texans made preparations based on forecasts and storm system models. Why he’s a student to watch: Villarreal is on the path to advancing how quickly weather models are created. Since late May 2017, he’s been writing Python code that automates the computation of meteorological data collected from weather balloons. How he got his start: Villarreal became familiar with the process of launches during a funded summer research trip to El Paso. “I worked really closely with Dr. Morris, Dr. Walter and Mr. [Mark] Spychala to get trained on the preparation, data mining and interpretation of data” involved in creating weather models. In total, he assisted in the launch of 25 balloons over the summer between Austin and El Paso. What’s next: The pathways to graduate-level research projects spearheaded by faculty are paying off for Villarreal. “It’s kind of heavy to see the weather models on TV, in part created by the balloons we launched during Harvey,” he says. He’s considering graduate programs in either financial engineering or theoretical engineering, both fields that rely heavily on the same technical coding skills he honed with weather balloon data. Why she’s a student to watch: Akomezogho is gaining hard skills for her future career as an actuary. As an international student from Gabon, Africa, she has always wanted to study in the United States. 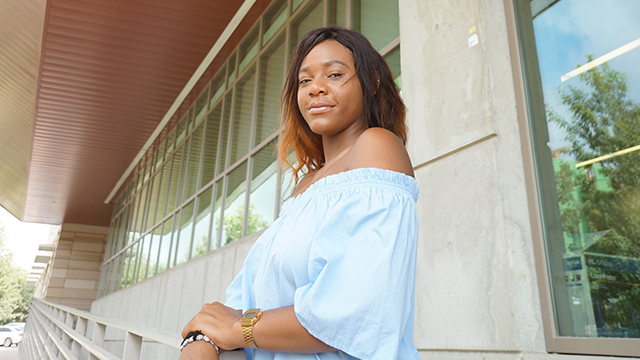 She’s taking full advantage of her experience by working in the Math Lab and serving as a teaching assistant in Calculus I.
What’s next: Gaining transferrable skills is important to Akomezogho, and she’s done it in a variety of ways through her liberal arts experience. During her internship, she “recalculated and verified the math so that we were working with clean data,” a task many actuaries at large firms must know how to execute. Her next step is applying those skills to an actuarial firm after passing the required exams. 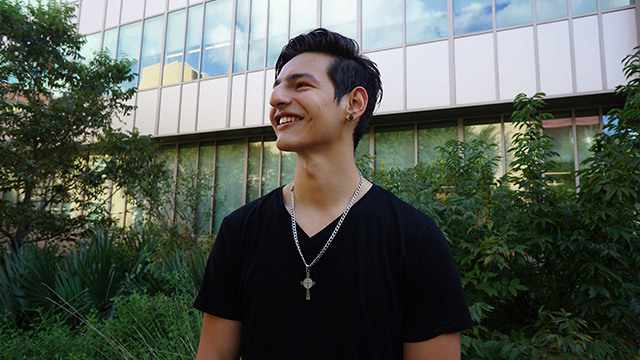 Why he’s a student to watch: Bocanegra is preparing for his future career as an engineer by writing code that interprets sounding data and visualizes it in graphs. He is earning dual degrees in Math and Engineering, in partnership with Washington University, and he works in the IT department. How he got his start: Bocanegra participated in an 8-week internship where he gathered 13 years worth of wind current data from the National Oceanic and Atmospheric Administration (NOAA) and wrote code to make the information accessible in a single click. “This project was three times past my expertise. I learned a lot, and it was very welcoming to have faculty as my mentors,” he says. What’s next: After earning the Math degree from St. Edward’s University in three years, Bocanegra will move onto earning his Engineering degree from Washington University. “As an engineer, you have to know your way around writing programs, so this experience was a good introduction to the field,” he says.